Acrylic on Illustration Board - 31" x 21"
A problem in choosing the image for this cover was that the heroine is consistently portrayed as being drab and uninteresting. Yet uninteresting is the last thing a book cover should be! To combat this, Michael faced her away from the light and contrasted the dreariness of her life with the promise of her future, represented by the stained glass window. There a dragon is fixed in the shape of a heart, the centerpoint of her soul's desire. The Creator Of Thomas Covenant Adds Eight New Wonders To The World. In his first collection of short fiction, the bestselling author of White Gold Wielder presents eight superb stories, including "Gilden-Fire," the famous "outtake" from Illearth War, and two brand new novellas written especially for this edition. 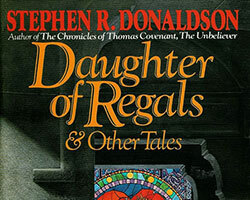 Enter a world of mystics and unicorns, angels and kings -- all realized with the same dazzling style and imagination that has made Stephen R. Donaldson a modern master of the fantasy genre. Daughter of Regals is a fantasy novella concerning a unique royal line and an unusual conception of magic. The Conqueror Worm is a deliciously creepy "horror" piece in which havoc is wreaked by one lowly centipede. Ser Visal's Tale begins as a simple story told over several flagons of wine at the local inn, this novella ends with a surprising twist. Gilden-Fire is the famous chapter about Korik of the Bloodguard and his mission to Seareach that was part of the original manuscript of The Illearth War, but omitted from the published version.